Wright State finance major Alan Hubler helps Cincinnati company expand its business into Canada through an internship. He’s pictured with Senator Rob Portman. Alan Hubler, a junior finance student at Wright State University, is making connections in Canada, thanks to an internship at Cincinnati Crane and Hoist (CCH). His internship was part of a program offered by The Ohio State University and organized by the Ohio Development Services Agency. Hubler, along with students from 10 other Ohio universities, participated in the Ohio Export Internship Program, which connects students with industry, academia and state and federal agencies that promote trade in Ohio. At Ohio State, Hubler attended an Export Internship Program class once a week during the spring semester. The class provides the interns with in-depth export training, access to professionals and experts in the field, case work and teaching skills. He and his classmates worked with a local business that created devices that detect pollution in the ground. After extensive research, his group determined that the company should pursue selling their products to South Korea and China, since China’s soil is extremely polluted and South Korea has very tough pollution laws. Once Hubler completed the class, he was placed with CCH, helping the company expand its business to Canada. Fifty percent of electricity in Ontario comes from nuclear reactors and five out of the top 10 infrastructure projects in Canada are either powered with nuclear power or hydropower. The type of cranes that CCH manufactures are used in nuclear and hydropower plants, so Hubler thought it would be a good idea to foster a relationship with Canadian businesses. He contacted construction contractors and researched quality standards for nuclear cranes and the logistics for shipping cranes from Cincinnati to Ontario. Liz said that Hubler was a valuable member of their company. “From day one we decided to make Alan a real member of the team, giving him real tasks and real responsibilities that are in use at CCH today. The experience has been beneficial for all of us,” she said. Hubler also created marketing materials for a new crane remote, which he helped present at a crane convention in Pittsburgh. Other exciting company events that Hubler participated in was a visit to Cincinnati Crane and Hoist by U.S. Senator Rob Portman, who recognized the company for its achievements in exporting. 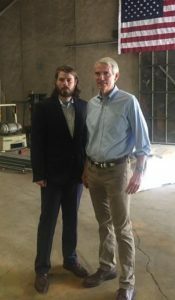 Hubler discussed small business credit limit issues and how weak enforcement of import laws is hurting small businesses in the United States with Portman. Hubler, who served in the Marine Corps, said that he chose to attend Wright State because of the military-friendly campus and the active involvement of business leaders in the Raj Soin College of Business. Kathy Marshalek, director of the Ohio Export Assistance Center in the Raj Soin College of Business, works with interns to help them better understand export trade practices and resources within the global community. For more information on the Ohio Export Internship Program, contact Kathy Marshalek at 937-775-3524 or Kathy.marshalek@wright.edu. Wright State became an independent institution in 1967 and spent the next 50 years growing into an innovative leader in affordable and accessible education. In 2017, it celebrates its 50th anniversary and sets the course for the next half century.